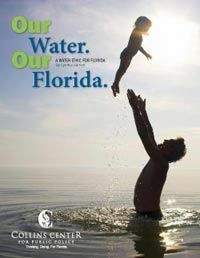 Collins Center Releases Proposal for New "Water Ethic"
In a new report, the Collins Center for Public Policy makes the case for a statewide water ethic to protect Florida's most essential natural resource--water. Managing freshwater has been a central theme throughout Florida's history. In the 19th Century, Floridians were guided by how much water could be pushed off the land. In the 20th Century, we were guided by how much could be pumped into subdivisions. In the 21st Century, we must be guided by our consciences. Value water, from appreciating local streams to being willing to pay an appropriate price for water. Work together to use less and less--rather than fight each other to grab more and more. Keep water local in order to avoid the financial, environmental and energy costs of long-distance transfers. Avoid the big mistakes of our history: over-tapping natural supplies and over-reliance on costly fixes that bring unintended consequences. Leave as much as prudently possible in nature--aquifers, wetlands and rivers--so that our children and grandchildren can make their own decisions about water.